Wabasso Creek is a stretch of water that bends east off the Intracoastal Waterway at Mile 942 just north of the town of Wabasso, the creeks namesake. Wabasso Creek and the town of Wabossa are five miles north of Vero Beach and six miles south of Sebastian. 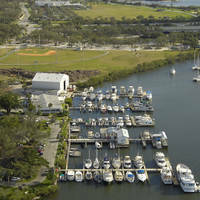 Wabasso Creek is actually part of the Intracoastal Waterway. The image above is a view from the northwest looking southeast across the north entrance to Wabasso Creek. The 65-foot fixed vertical clearance Wabasso Creek Bridge can be seen crossing the Waterway at mile 943.2, with Wabasso Island bordering the right (west) side of the channel and Wabasso Beach entering from the left (west). There is one marina along the Wabasso Creek stretch and it is located just south of red daybeacon 90. Sea Oaks Town Docks has limited space available for transients. Be sure to call ahead for details. Anchoring is not recommended along the route, dues to the narrows nature of the creeks channel. 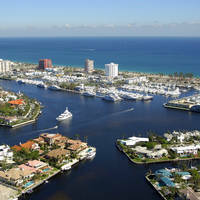 Prime anchorage, moorings and marinas can be found about five miles farther south at Vero Beach. The approach to the northern entrance to Wabsso Creek is fairly easy and straightforward. The southeastward bend of the ICW into Wabasso Creek starts with flashing red 76 about a mile north of the bridge, and is followed by red daybeacon78, flashing green 79, and red daybeacon 80. The next set of marks, starting with green daybeacon 81 start just below the bridge. The entrance channel is clearly visible in the imabe above - just follow the boat wakes. No reviews yet! 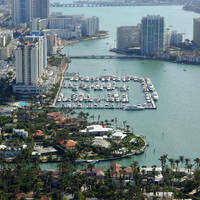 Be the first to write a review of Wabasso Creek North Inlet.